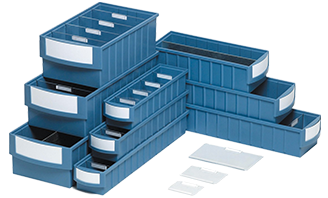 Whether at home, in the office or in an industrial setting, the key to a successful storage system is organisation. Ensuring the organisation of your storage system makes it much more efficient and enables you to quickly and easily pick and identify your stored objects. Ireland’s leading storage provider, Rackzone can help you to achieve this goal with our range of high quality plastic shelf bins. Each shelf bin has a white paper label to the front which allows you to clearly identify the contents of each bin. When you need shelf bins with extra length, this product is the ideal solution, allowing you to store a large number of different smaller items. If you need to store items which are greater in width, these 145mm x 500mm x 235mm plastic shelf bins are the ideal solution. These shelf bins dividers are used to divide the contents stored within each shelf bin. They are available in three different widths – 113mm, 153mm and 235mm – with your choice depending on the width of your shelf bin.